The Fish and Flower Market of Bergen is a great tourist attraction. In fact, made popular by tourists, this is your destination to explore the culinary brilliance of this country. Fresh seafood is available here not only for your kitchen, but also for your meals right here! Sit on one of the benches, in the shade, and enjoy bites of exotic traditional recipes. With the history of the market dating back to the 1200s when merchants and fishermen used to meet for business, this market has come a long way, not only adding to the authenticity of the city, but also to the experience of any tourist. 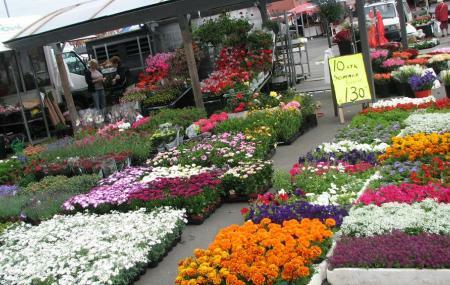 Not only limited to seafood, this market has crisp produce of fruits and vegetables, and brilliant stalls of flowers. A small tip would be that the flowers here are quite affordable as compared to a florist, so if you’re looking forward to making the day special, this destination is perfect for you. How popular is Fish And Flower Market? People normally club together Floibanen and Bergen Cathedral while planning their visit to Fish And Flower Market. Very interesting place to walk around, smell and try local food. Everything is very fresh and many places offer free samples. You at least gotta try it! I don't think I would try to carry any food back to the US, perhaps have them ship it if you really want it. I found the tubes of caviar interesting. Food is delicious but WARNING you can’t bring this food back to the States. Despite what vendors will tell you US Customs won’t allow you to bring meat, even if it’s dried, back through customs. Fish is generally acceptable but not sure how they feel about whale If you are just sitting down for meal, great choice. Of course it is a bit more expensive than other places but the view is nice and the ambiance will make you enjoy your time. The oyster there was really great. Very expensive compated to our prices. Norwegian salmon more expensive in Norway than here.